Surely the most revered, popular, lung-bursting, talked about Lindy hop sequence ever captured on film must be the flying trapeze artistry of Whitey’s Lindyhoppers from the 1941 film, Hellzapoppin. It has been discussed by almost any dancer of experience I’ve ever met, written about in Frankie Manning’s book, and even been reproduced in more recent times at events like Frankie95 in Manhattan as the climax to the tribute show given on the Sunday evening of that remarkable event. However, something quite special happened in the film musically just before that dance scene and it lasted little over two minutes. Who was responsible for this magical prelude to Lindy hop history? Well the first musician you hear is Slim Gaillard. If you’re a friend of mine, a friend of Swing music, or a friend of Swing dance (good.. otherwise you may have come to the wrong place! ), you won’t need much information about him. Popular tunes such as ‘Jump Session’, ‘Tutti Frutti’, ‘Cement Mixer’, ‘Potato Chips’ offer a flavour of the playful irreverence within his piano mastery. Next up is his sparring partner of the time, Slam Stewart. Same deal, Slam played bass on ‘Tutti Frutti’, ‘Vol Vist du Gaily Star’, ‘Dopey Joe’, ‘The Flat Fleet Floogee’, ‘Jump Session’ to name a few of their recordings as ‘Slim and Slam’ as the 30s swung into the 40s. That’s Slim and Slam introduced to the action, trading as they gradually build for the Swinging feast to come. After Slam’s last solo, they play together and then – break! That’s Slim doing a little nifty short tap routine you hear. And when he beats his foot down for that last time, in comes..
After his time with Fletcher Henderson came to a close in the early 30s, Stewart came to join Duke Ellington’s group in 1934, essentially filling the chair of Freddy Jenkins. Two years prior to Hellzapoppin, he was touring Europe and recorded as Rex Stewart & his Feetwarmers with a couple of other Ellingtonians and Django Reinhardt. After leaving the Ellington band, he formed ‘The Rextet’ and toured that group in Europe, and in the 50s directed the Fletcher Henderson All-Star Reunion album sessions. So now you can hear they’re all three playing and having a ball. By this point, Slim has cast aside the ivories and plays guitar from here. After Rex finishes his part with a lovely little repeated muted motif, in comes that searing clarinet sound. This here is Elmer Fain. Fain played alto and tenor sax as well as clarinet, and was also an organiser during the 30s, a talent agent, an active leader in the musicians’ union and an orchestra leader in his own right. Buck Clayton remembered bandleader Fain as someone ‘who never gave the musicians hell about anything probably where he should have’. Too nice for his own good? 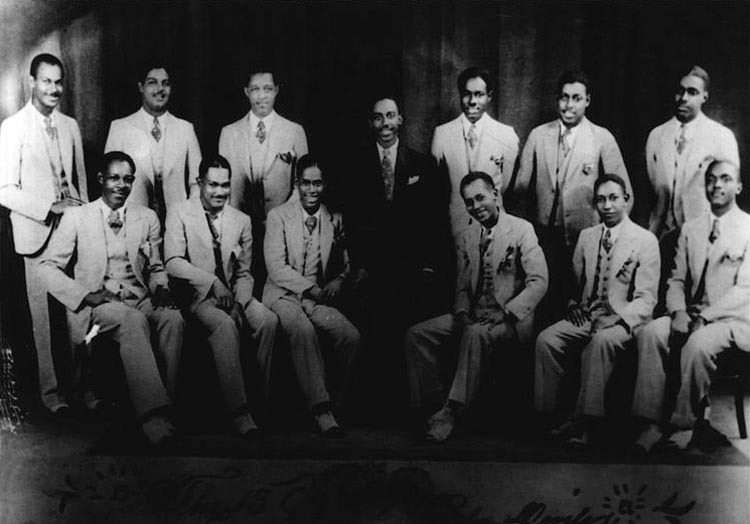 Not content with all of these projects, Fain picked up other musical roles in movies, including this one where he sits second from left in the front playing alto sax in the 1938 picture ‘Going Places’. So Slim and Slam, Rex and Elmer, all going at it and what is this that’s building? Never heard anything like it. It’s joy! That’s what it is! Come in Jap Jones, and take your turn! These guys are now cooking! There’s steam coming from every valve, smoke from every finger. Where can they go from here?? The pressure’s relieved by those heavy beats. The tom toms and Cee Pee Johnson comes in to round out the six. Johnson had quite the career working as bandleader and entertaining successfully at a host of clubs in California in the 40s, as well as being a singer and dancer in the early 30s. 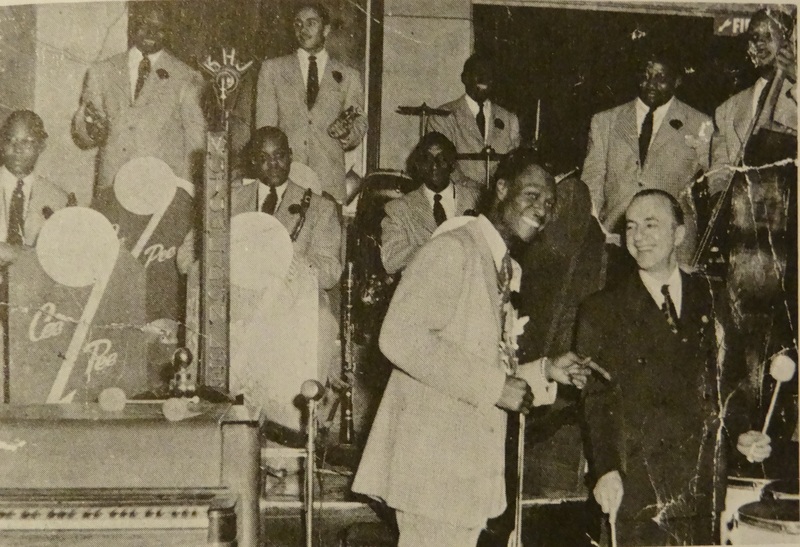 His frantic tom-tom playing belied the fact that he had a jumping band at Billy Berg’s Swing Club in 1942 with Teddy Buckner and Karl George on trumpets, Ed ‘Popeye’ Hale (3rd from left) on alto sax, Buddy Banks (5th from right) on tenor, and Joe Liggins (3rd from right) on piano. He scored a hit in 1945 with ‘Hour After Hour’. But what about having ‘Citizen Kane’ on your roll of honour? Johnson played drums in the band in the Everglades beach party scene. The band performs a Charlie Barnet composition, ‘It Can’t Be Love’. Raymond Tate is playing trumpet, Buddy Collette is on alto, Buddy Banks on tenor and Alton Redd sings. So, I’ve not put THAT Hellzapoppin clip up here because this isn’t about the dance sequence! But just for you dancers, here is Cee Pee Johnson beating out a solo at 1:06 during Dorothy Dandridge singing ‘Swing For My Supper’ and a whole lot of Swing dancing’s goin’ on. Great read, thanks! It should also be noted that the music was recorded after the dance performance. While filming the actual dance scene, Whitey’s Lindy Hoppers were dancing to a recording of “Jumpin at the Woodside”. Thanks for researching / compiling / writing the history for everyone. It helps make the music and video more alive. This post should be read by thousands (hundreds of thousands? ).